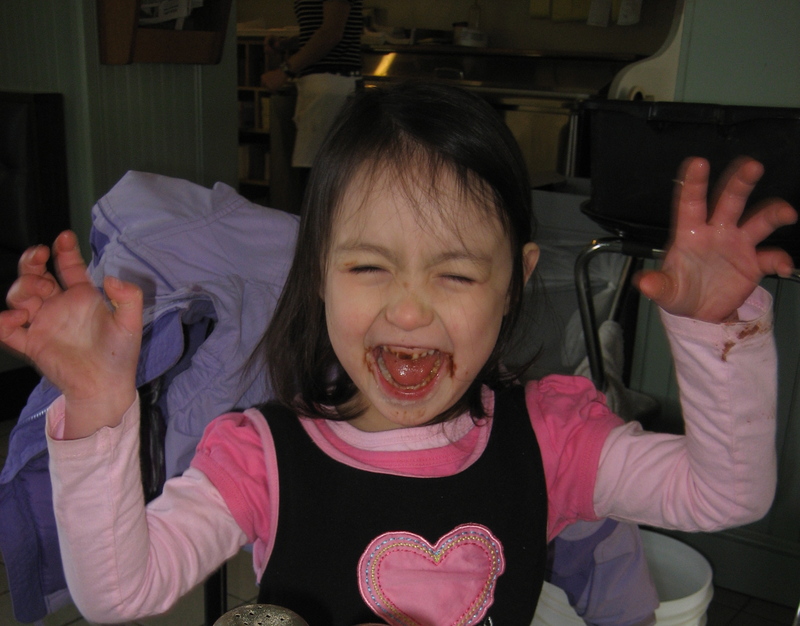 Fiona's impression of "panic" -- with a mouthful of chocolate doughnut. Hello, my name is Faith, and I’m a perfectionist. Actually, I’m a recovering perfectionist. I expect to be in recovery for the rest of my life. This is not intended as a cute, “Boo hoo, I’m soooo perfect!” quasi-lament. On the contrary, I consider perfectionism to be equally as addictive as controlled substances, and potentially as damaging. But don’t be fooled: if you truly desire perfection, you have put yourself in an untenable position. NOTHING in life is perfect — or if it is, it doesn’t stay that way for long. So, by proclaiming yourself a perfectionist, you are placing yourself in opposition to the universe. And if that isn’t a recipe for bitterness, disappointment, and strained relationships, I don’t know what is. Just as there are a variety of substances available for addiction, there are a variety of outlets for perfectionism. You may be a perfectionist when it comes to your work, your food and coffee (that was a big one when we lived in the Bay Area), your appearance. I am a (recovering) social perfectionist, which means that I care too much about what other people think of me in social situations. I believe this is the perfectionism equivalent of crack cocaine: you can’t win. One thing that my perfectionism sometimes leads me into is a little game I call “Script the Social Interaction.” In this game, before I head into a social situation, I script it out in my head beforehand. I think about how I want to come across, and I plan what I’ll say to the various people who will be there. Then, during the social interaction, I will actually give myself direction (“Nod less, smile more. NO, don’t talk about your kids!”). And of course, afterwards the critics weigh in (“Idiot! NEVER ask an economist about their research!!”). It’s like having the entire motion picture industry inside my head: crowded and exhausting. (And please tell me that some of you do this, too. Even if you’re telling me very slowly and hoping that I don’t notice you dialing 911 behind your back). ANYWAY, my point is that sometimes I do this, but I’m trying to stop as part of my perfectionism recovery. Because if you can’t be real and open with people, it’s impossible to have genuine relationships. If I’m only concerned with maintaining a perfect front during social interactions, what’s the fun in being my friend? I’ll bring nothing interesting to the relationship, and will only make you feel bad that you’re not as perfect as I appear to be. If, on the other hand, I’m able to relax and be myself and share imperfections like (theoretically): “Sometimes I yell at my kids and feel like a horrible mom,” or “Sometimes when my husband is talking about his day, I’m really wondering whether he’ll make us popcorn after dinner,” — well, you still may not want to be my friend, but at least you won’t feel inadequate by comparison. And you know what’s really helping me get over this perfectionism? KIDS. A perfect example of this happened last summer at the A & W. This is a classic drive-in restaurant with simple, greasy food. It’s only open during the warm weather months. (The A & W is Campbell’s favorite place; she calls it “The ABC,” and all summer long, whenever we’d drive past it, she’d scream: “Look! The ABC! !”) You can either eat right in your car, or at picnic tables in a large grassy field next to the parking lot. The Gong Girls prefer the picnic tables, because there’s a big bucket of plastic outdoor toys (balls, bats, frisbees, etc) nearby. 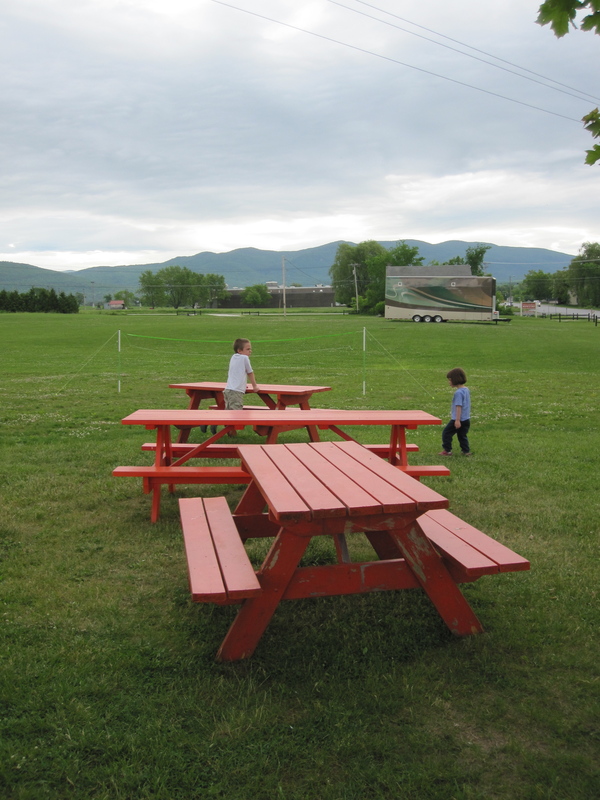 The Gong adults prefer the picnic tables, too, because WHY would we be having 3 kids eat in our car if we could have them running around in a grassy field instead?!? One evening in late summer, we met the girls’ friend Ruth and her parents for dinner there. It was a magical summer night: golden sunset, pleasant adult conversation, the girls running through the grass pretending they were being chased by aliens. It was when all three girls were happily dancing on top of an unused picnic table that we heard it: “Mommy, Mommy, I’m POOPING!” Turns out Fiona had been having so much fun that she’d neglected to tell us she had to use the bathroom. So there she was: holding up her dress, laying one right on top of the picnic table in full view of Rte. 7 and the other A & W diners. (This was one of those moments when my entire parenting life flashed before my eyes. I wasn’t sure whether to laugh or be horrified, so I sort of did both). This being a small town, the A & W diners were: us, Ruth’s parents, and another family that we know from church. So the good news was that everybody there knew us…aaaand the bad news was that everybody there knew us. So, if you’re ever in Middlebury and you’re not sure where to find us, just ask anybody for “That mom whose kid pooped on top of the picnic table at the A & W” and they’ll point you the right way. And yes, we will be telling this story at Fiona’s wedding. YES I PLAY SCRIPT THE SOCIAL INTERACTION. Now I have a name for it!